How will you prevent everyone from being killed in Bosnia and Herzegovina? 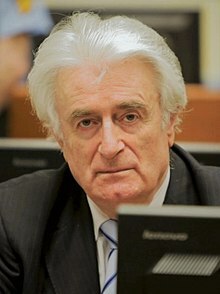 Radovan Karadžić (Serbian Cyrillic: Радован Караџић) (born June 19, 1945) is a former Serbian politician, poet, political doctor, psychiatrist, and war criminal. He was convicted for war crimes and genocide by the International Criminal Tribunal for the former Yugoslavia in The Hague. This, what you are doing, is not good. This is the path that you want to take Bosnia and Herzegovina on, the same highway of hell and death that Slovenia and Croatia went on. Don't think that you won't take Bosnia and Herzegovina into hell, and the Muslim people maybe into extinction. Because the Muslim people cannot defend themselves if there is war here. Variant translation: "You want to take Bosnia and Herzegovina down the same highway to hell and suffering that Slovenia and Croatia are travelling. Do not think that you will not lead Bosnia and Herzegovina into hell, and do not think that you will not perhaps lead the Muslim people into annihilation, because the Muslims cannot defend themselves if there is war – How will you prevent everyone from being killed in Bosnia and Herzegovina?" There is no doubt that the United States and Germany had their own interests in igniting wars in Croatia, Slovenia and Bosnia. Radovan Karadžić speaking in May 2011 during a magazine interview given from Scheveningen Prison, The Hague. — "Radovan Karadzic: The other side to the Bosnian story", Politics First (May 2011). In one of his many public statements, the leader of the Bosnian Serbs, Montenegrin Radovan Karadžić, said the Serbs in the past period, when everyone was on their side, had been subjected to "genocidal extermination" whereas now, over the last year, when so many are against them, they are suffering the least. Of all the innumerable absurdities and untruths that have been uttered, this statement truly takes the cake. For more than forty years Bosnia was inhabited by Bosnians, and we did not distinguish between Serbs, Muslim, and Croats, or at least such distinctions were not paramount in their mutual relations. Throughout that period, to the best of the Yugoslav and world public's knowledge, there were no detenction camps for Serbs in Bosnia, no brothels for Serbs women, no Serbian children had their throat cut. (...) But according to Karadzic, the Serbs were somehow unhappy then. And now, in war, with so many dead, (...) now, according to their leader, the time has come when they are suffering the least. (...) Ethnically pure states are an impossibility in today's world, and it is ridiculous to try to create and maintain such a state, even when there is just one nation.